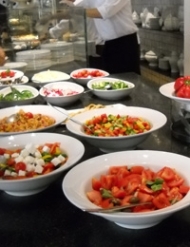 Comments Off on Yes, they really do eat salad for breakfast in Israel! Posted by admin on Mar 30, 2013 in Articles | Comments Off on Yes, they really do eat salad for breakfast in Israel! Whether we stayed in a flash hotel in Jerusalem, on an Orthodox Jewish kibbutz or in an Arab B&B in a small town, everywhere it was the same: the healthiest breakfasts you can imagine. They consisted of salads: the two core ingredients are chunks of tomato and cucumber, plus red onion, capsicum, feta, herbs (parsley and mint) and olives. (Not a fan of olives, I substitute red grapes.) Traditionally Mediterranean salads do not include lettuce but there were lettuce salads, with carrot, mushrooms, courgette, tabouleh, chickpeas, seeds, nuts (walnuts) and more. There were also eggs several ways, fish (including my favourite: smoked salmon), yoghurt, cheeses, hummus (the real thing – absolutely delicious), pita bread, fresh and dried fruit (apricots, figs, dates, apples) and cereals. There was no meat as dairy and meat are not served together where kosher is observed. Israelis eat salad with every meal. That is how they were brought up and is traceable back to the early kibbutz days when the goal was self-sufficiency and vegetables were what they could produce to feed a new nation. As well as combining Mediterranean and Middle Eastern influences, many dishes were brought to Israel by Jewish immigrants from Europe, Russia, Ethiopia and North Africa. One very popular and simple breakfast dish is shakshuka which was brought from North Africa (various sources say Tunisia, Libya, Morocco or Ethiopia): eggs cooked in a spicy tomato mixture. You can replicate it very simply by heating a tin of spicy chunky tomatoes in a small frypan, simmer to reduce slightly, lightly mash, break in eggs (as if poaching), cover and cook just a few minutes until the eggs are cooked to your liking. I find it fascinating that the way we eat is so influenced by our culture and what we believe is normal. Experiencing the food of another culture in context can be a very liberating experience as you realise you don’t have to conform to your own cultural expectations about how, what and when to eat. I came home resolved to change my thinking. I want eating salad for breakfast to become my new normal! Continue to apply the new habits you have mastered (eating when hungry, stopping when satisfied, using a small plate whenever possible). Continue to look out for healthy choices on menus. Plan ahead. Carry fruit and healthy snacks with you so you don’t worry about where you’re going to find food next as you travel or when you get hungry. Take picnics of healthy food you have prepared yourself, rather than be tempted by rich food in cafés or fast-food outlets. Enjoy local gourmet specialities by eating them slowly in small portions and really savour the experience. If you are not hungry, take them with you to enjoy later. Plan and build your holiday around physical activities such as walking, snorkeling, fishing, golf or skiing. Enjoy the great outdoors, walk tracks in national parks and take walking tours of cities. Choose accommodation with a gym and swimming pool and enjoy using these to keep your activity levels up. Treat yourself to a spa or have a massage to keep focused on looking after your body. Remember that food is no longer a main focus for you. Focus on other ways and activities to enjoy your holiday. And thinking globally, I’m thrilled to announce the launch of Fat Chance Online! which means the Fat Chance! weight loss programme is now available via the internet to anyone, anywhere in the world! I probably won’t sell many in Israel though. With all that healthy eating they really don’t need my advice.